David Pogue was in true Pogue-ian form today in “Late Night with David Pogue,” the kick-off feature presentation before opening the Macworld Expo showroom floor. After a brief tongue-in-cheek introduction by Expo general manager Paul Kent as “Steve Ballmer,” (“Rock the new era,” indeed! ), Pogue wasted no time in cracking jokes. Like a one-man episode of Saturday Night Live that was actually good, Pogue entertained and even informed with a series of monologues and skits. A “Sounds of Silence, the Tech Support Song” performance (a parody of Simon and Garfunkel’s hit song) netted a few laughs, and stories about using Twitter to crowd-source things like San Francisco sight-seeing tips and quotes for a Twitter book proved that the service can actually be useful. Midway through the show The Gregory Brothers—the band-turned-YouTube-stars behind the wildly viral Auto-Tune the News series—made a surprise guest appearance. Pogue interviewed the team about their inspiration and what Mac hardware, software, and other tools the use to produce the videos. 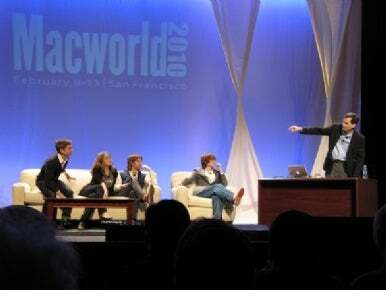 The Gregory Brothers drop by Late Night With David Pogue at Macworld Expo Thursday. 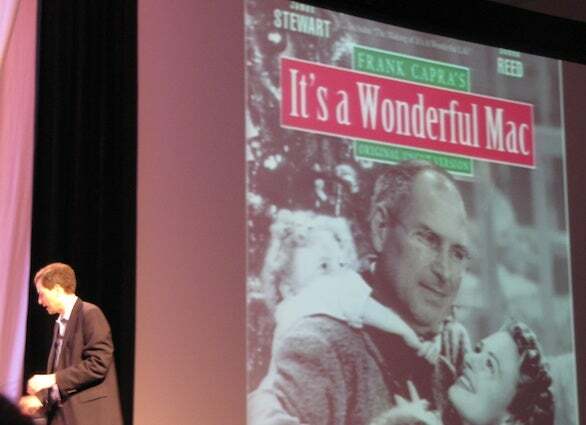 Pogue kept The Gregory Brothers around to help wrap up the show with an on-stage reading of “It’s a Wonderful Mac.” A play set in Apple’s Dark Ages circa 1998 and spoofing Frank Capra’s 1946 It’s a Wonderful Life film, Pogue wrote Jobs as the down-on-his-luck CEO who wished he had never founded Apple. After wrangling The Gregory Brothers members and Paul Kent to read various roles, Pogue realized he was short one actor to play Steve Jobs himself. 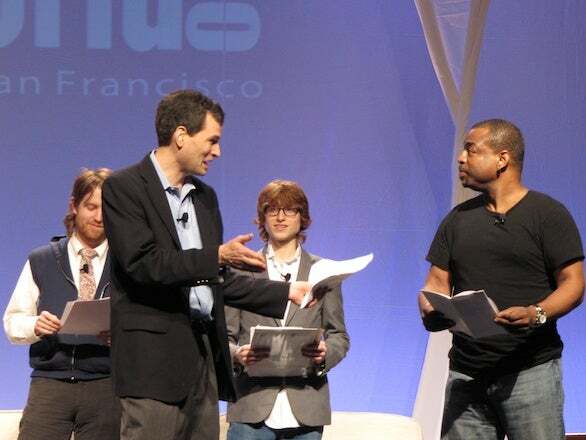 Fortunately, LeVar Burton (yes, that LeVar Burton ) volunteered from stage left, and many puns and lessons were learned about how many products and technologies we would miss had Jobs truly never founded Apple. Every time a bell rings, Apple releases a new product. Just imagine: a world without the USB and CD-ROM drives, and 95 percent of computers running DOS 22.0 because there was “never a graphical Interface for Microsoft to copy.” Subsequently, the Internet also never happened because, in Pogue’s Apple-less 1998, Marc Andreessen, the would-be developer of Netscape, instead worked at a Burger King in Cincinnati. To wrap up the “late night,” Pogue sat down for a candid interview with Burton to talk shop about how much the actor actually hated wearing his Visor on Star Trek (and why) as well as future plans for video production and acting. Burton fans may be happy to hear that, after a dozen years behind the camera and producing films, he will soon return to the other side of the lens, and Reading Rainbow is making a comeback. “Late Night with David Pogue” was a great way to help “rock the new era,” as the Macworld Expo posters littered around the Moscone Center proclaim. Light-hearted humor and surprise guest appearances certainly rocked the house.